We started from Queenstown towards Milford Sound at around 8 in the morning. Milford sound is a fjord that is some 5 hours from Queenstown. Because we did not want to switch hotels, we attempted to do it as a day trip from Queenstown. Driving away from Queenstown, we were already hit with amazing scenery. We had barely left Queenstown! There were very few places to stop on our way to Milford Sound. We could only find one set of restrooms on the way, around 3 hours from Queenstown. There are also no gas stations until you hit the town of Te Anau. While the road from Queenstown to Te Anau is mostly plain, past Te Anau is when the beauty starts setting in. Since we had reservations for a cruise in Milford sound, and we were already running late, we promised ourselves that we would stop at all these places on our way back, and continued on. Pretty close to our cruise time, we reached Milford sound visitor’s center. Inquiring at the visitor’s center, we found out that we had to walk another 15 minutes to reach the cruise terminal. We broke into a brisk jog to get to the terminal on time. Thankfully, there was a huge line waiting to get into the cruise, and we were able to tag on to the end of it. After getting onto the 1:30pm cruise, we were first served lunch (you can request special vegetarian/Indian meals ahead of time, and is included in the cruise). Since we were pretty hungry, we gobbled up our lunch first, and then headed to the top of the boat to take in the views. They were spectacular, to say the least! Tall pitons and mountains rose out of the water, as our boat glided along. Small waterfalls dotted along on the peaks, and some were even snow capped! The cruise went past some rocks, where we saw some seals sun bathing. Our next treat was a pod of dolphins that circled around our boat! 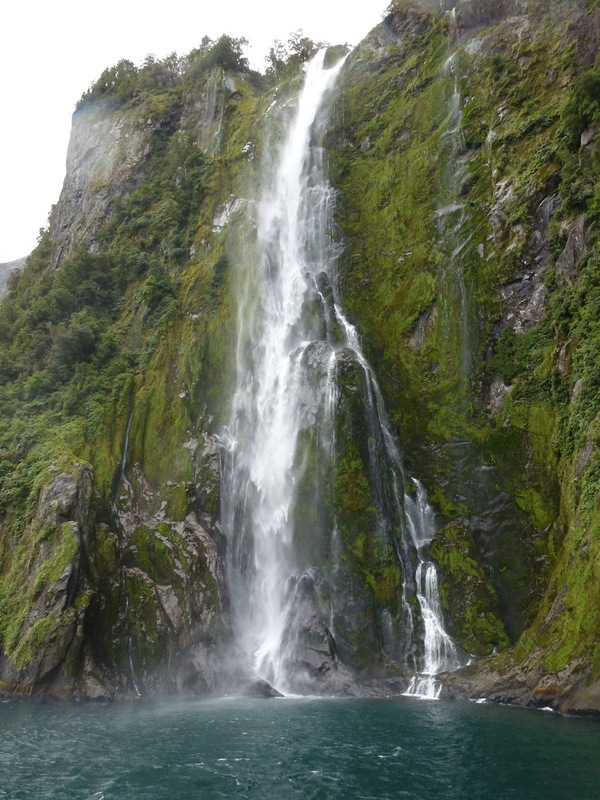 The 2 hour cruise’s last highlight was Stirling falls…the boat actually took us under the falls, and anyone standing on deck was splashed in the cold water! Ofcourse, we made sure to stand on the side that actually went under the falls, and came back soaking wet. The cruise ended at around 3pm, and we left the cruise terminal and started our drive back on Milford sound road. Our plan was to stop along the way because we couldn’t do it in the morning. Our first stop was The Chasm. Most tour groups stop at this point on their way to the sound, so it was a good idea to come here in the evening, since we were the only ones there. A short walk on a forest trail led us to a river that was carving out formations in limestone as it tumbled into a chasm. We next stopped along the road next to Homer tunnel. We saw a spot that just invited us to walk into it, and the grandiosity of the place cannot be captured on camera. To me, this was the highlight of the whole trip to Milford sound! We also spotted a waterfall here that you could wade into (which we did)! Our last stop was Mirror lakes. These are series of still lakes that wonderfully reflect the surrounding landscape. We stopped at Te Anau for dinner on the way back. Usually, there are plenty of options, but unfortunately, today was Christmas. Every restaurant was closed, except a Chinese place, so we were able to get some veggie fried rice. We continued our drive back to Queenstown, and reached late at night and crashed after the long day out. Tomorrow, we head to Glenorchy!